The section will be carrying out reassurance patrols today (5/10) and next week ahead of the wedding of Her Royal Highness Princess Eugenie of York to Mr Jack Brooksbank on Friday 12 October. 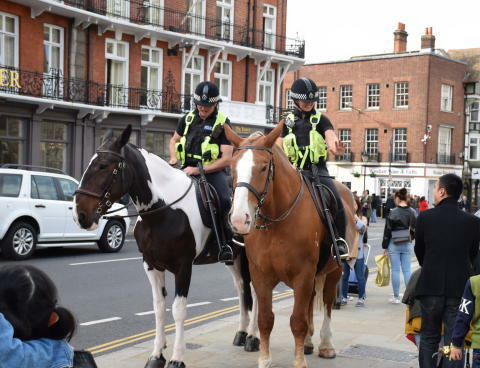 Those in the town on Tuesday, Wednesday and Thursday may catch a glimpse of Odin and Atlas and their riders PC Patrick Frost and PC Tracey Pool on the Long Walk and in Windsor town centre, deployed as part of the wider security operation. On the day of the wedding they will be joined by four further horses from Thames Valley Police’s Mounted Section and their riders. PC Frost added: “We are proud to be part of this special event and on the day of the wedding we will be monitoring the crowds and ensuring their safety from our vantage point as part of the wider security operation. Further information and images are available on our digital media page.